Iterations let you test a combination of model settings for testing methods such as Monte Carlo and parameter sweeping. Iterations initialize during test execution but before model callbacks and test callbacks. Once you create a test iteration object, you can override aspects of the test case for each iteration using the class methods. You create your iteration script in the text window under the Iterations section of a test case. 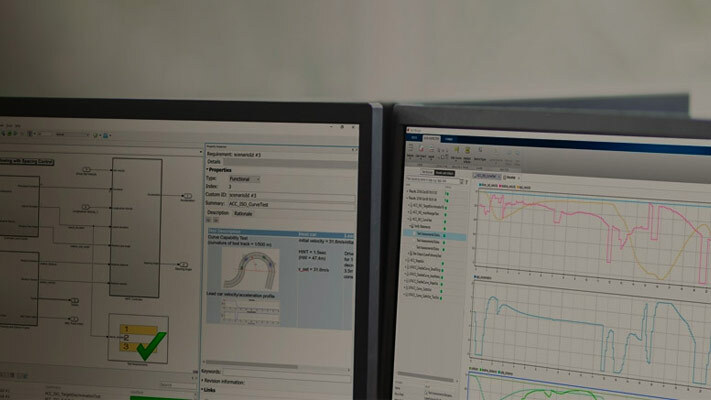 Iteration scripts cannot run in the MATLAB® command window. The examples scripts in this reference page must be inserted into this section and other sections of the test case must be defined. For more information on iterations and scripted iterations, see Test Iterations. iterationObj = sltest.testmanager.TestIteration returns a test iteration object. The object is used to construct a single iteration in a test case. Each iteration you want to create in the test must use a single iteration object. 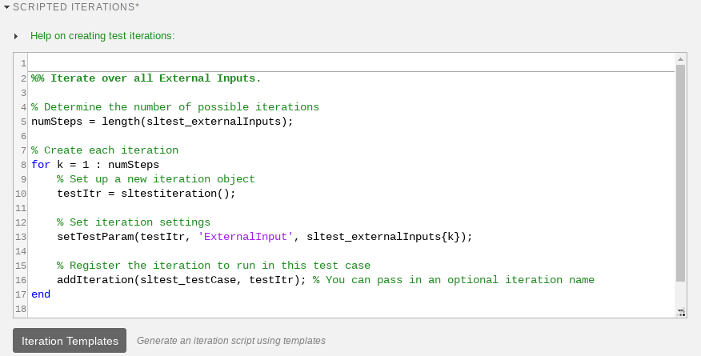 You can also create a test iteration within a iteration script using the sltestiteration function. Name of the test iteration, specified as a character vector. The iteration name must be unique from other iterations in the test case. Set of model parameter overrides for the iteration, returned as a cell array of character vectors. Set of test parameter settings for the iteration, returned as a cell array of character vectors. Set of model variable overrides for the iteration, returned as a cell array of character vectors. In this example of a scripted iteration, specify the model in the test case to be sldemo_absbrake. The iterations are generated during test execution. This section of script is in the Scripted Iterations section of the test case. It will execute only in the Scripted Iterations section. The sltest_testCase is a variable defined for you in the Scripted Iterations section, which is the parent test case object of the iteration. In this example of a scripted iteration, there must be parameter sets defined in the Parameter Overrides section of the test case. The iterations are generated during test execution. This section of script is in the Scripted Iterations section of the test case. It will execute only in the Scripted Iterations section. The sltest_testCase is a variable defined for you in the Scripted Iterations section, which is the parent test case object of the iteration. If you do not want to use a script to create iterations, then you can use table iterations in the test case. For more information about table iterations, see Test Iterations.